The wonderful bike repair-man round the corner serviced my bike, which needed a new brake cable and brighter lights. I set off with slight uncertainty - I hadn't ridden it since my fall in January - but, even with the tricky load of heavy back-pack and carefully-balanced sword-bag, it seemed as though I was gliding along the cycle track. I was filled with pleasurable anticipation as I approached the leisure centre. I was slightly late for the warm-up session so was still wearing my jeans as I joined the end of the footwork practice - fortunately my lunges aren't deep enough to cause any embarrassing tears in the fabric. I felt so good at having cycled and warmed up that I was on a plateau of calm contentment as I headed off to change into breeches. 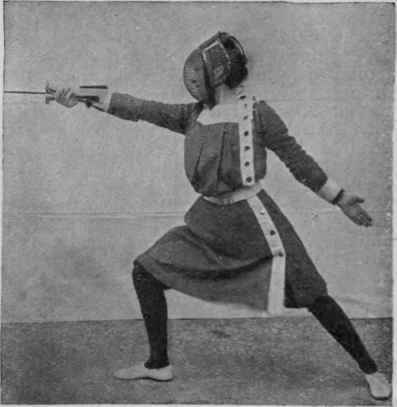 The calm continued as I met the ex-foilist in a return bout, and I quickly learned that it's not a good frame of mind for a fencer. There was no sign of the confident aggression I'd displayed in the previous week. Instead I seemed to have absorbed the ex-foilist's most dangerous flaw - I defended without turning defence into attack and paused fractionally before attempting a hit. Of course he took advantage. Meanwhile I could see what I was doing wrong but attempts to correct the error resulted in longer and longer pauses. He beat me with ease at 10-3 and was justifiably delighted, if puzzled by his success. I continued to fence in the calm bubble, aware that I was repeating the same error and unable to escape it. Eventually, against the Spaniard, I stopped pausing and fought back. She beat me, of course, but I managed five hits to her ten. Even though she didn't have to try very hard, that was a noticeable improvement. Finally I took on the ex-foilist again. I began well but he was confident from his previous victory. He pulled back and overtook me. I struggled, did my best and we reached 9-9. Confidence and speed were on his side. I didn't really expect to win and didn't. After the earlier crushing defeat I was pleased enough - too pleased? - to be beaten 10-9. Perhaps next week I'll care about winning again. I remained calm and content as I cycled home with my new bike-lights bright in the autumn dark. What better reason to fence?